Every country cook needs to know these 10 kitchen hacks to make their country life a little easier. From organization, cooking shortcuts or preparation tricks, there are several hacks every country cook should have in their back pocket to be pros and take charge in the kitchen. Sometimes the simplest changes or tricks can make life easier, shortening the time spent preparing meals and leaving more time for family around the table. Check out these 10 kitchen hacks and discover how you can make your country life easier. 10. A little organization goes a long way. As a country cook, there is never a shortage of baking that needs to be done. Keep your baking supplies organized in containers, as shown above. With this drawer storage trick, biscuits can be whipped up in a moments notice without useless trips to the pantry. 9. Cast iron, useful and decorative all-in-one! 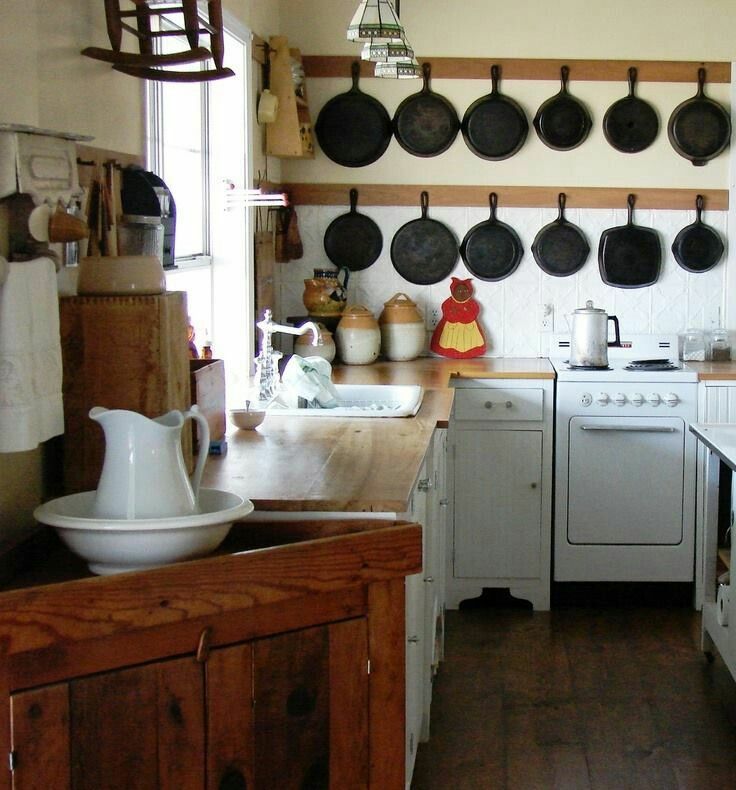 Every true country kitchen has a cast iron skillet or two. Instead of storing them stacked in a cabinet, showcase them above the stove for a country feel and easy access. 8. Bring the herb garden indoors. There are thousands of ways to utilize mason jars. Using a piece of wood, copper clamps, chalkboard paint and a few mason jars, you can quickly create a rustic indoor herb garden. You can instantly have fresh herbs at your fingertips! 7. DON'T THROW OUT THE BACON GREASE! Bacon absolutely makes everything better, but sometimes you may find yourself wanting to toss out the container of grease that has been sitting there for a week...DON'T DO IT! Grab yourself an airtight aluminum container, fill it with the grease and toss into the freezer for use a later time. 6. Lose the potato peeler. Pounds and pounds of potatoes get cooked in a country kitchen on any given day. Instead of wasting time and energy with a peeler, use this ice water trick to get your potatoes from stove top to table ready as quickly as possible. 5. Get clean ears every time. There is nothing more frustrating than spending tedious time pulling silk of off corn on the cob before you boil it. Use this microwave hack to get clean ears of corn every time with hardly any effort. 4. Maximum cutting board space. Ditch individual cutting boards and swap out traditional counter tops with a butcher-block top for a quick and easy surface to prep your meals. Blocktops are great for most prep, but keep any raw meats on seperate surfaces so you don't risk contamination. 3. Never crack a bad egg again. Instead of playing the guessing game, test your chicken eggs by placing them in a glass of water. If it sinks flat, you are good to go. If it floats, toss it in the trash. 2. Nobody likes a bud...on a potato. Nothing is more annoying than pulling out a bag of potatoes to find that buds have begun sprouting. To avoid any future unwanted buds, store your potatoes with apples. 1. Quickly get rid of excess fat in soups or stocks. By wrapping a few ice cubes in paper towels, you can easily remove excess fat from your soups. Skim the surface with the ice cubes and the temperature difference will cause the fat to solidify making it much easier to remove.